Thank you, Readers, for the phenomenal response to the Barbar Professional Hair Tool giveaway! Congratulations to our winner, Anne Marie, comment #491, courtesy of Random.org! Have you heard the latest from Barbar? Ellen DeGeneres told People magazine her hair tool of choice...none other than the Barbar Italy 3800 Ionic Charger Blow Dryer! People magazine included the Italy 3800 in their Feb 2011 feature of DeGeneres! The Barbar Italy 3800 Ionic Charger Blow Dryer is equipped with an ionic charger and imported AC motor that heats hair while circulating air to ensure soft and shiny results! This is another of BARBAR's "power dryers", meaning dry time is cut in half! 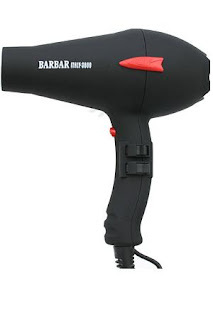 Style your crowing glory like a star and get your own Barbar Italy 3800 dryer from Barbar's online store!